Michael Christian’s “I.T.” is a giant insect with a past. 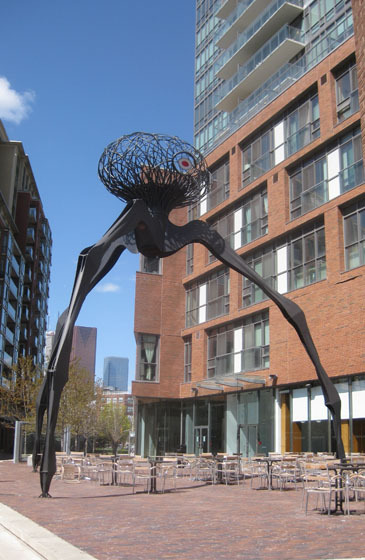 “I.T.”, a 40 foot tall sculpture made from 10,000 pounds of steel, sits astride one of the entrances to the Distillery District. It was shipped here in 2009 after an appearance at the Burning Man Festival in Black Rock City, Nevada. At Burning Man, up to a dozen people at a time were allowed inside its head, which rotated, shooting a bright spotlight from its red oscillating eye. In the Distillery District, surrounded as it is by condominiums, the eye-beam has been disconnected, and the head is off limits, but this is the “Frozen North” not Black Rock City. BELOW – another Distillery District sculpture, “Still Dancing”, by Dennis Oppenheim, 2009.